Toray Films Europe's new metallized-BOPP film operation is depicted on the left. 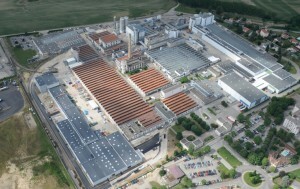 The first commercial volumes of metallized, biaxially oriented polypropylene (BOPP) film for packaging applications have been achieved at Toray Films Europe’s new manufacturing plant in Rhône-Alpes, France. The US$86-million facility turns out Torayfan® metallized, heat-sealable and non-sealable, high-oxygen-barrier and high-moisture-barrier films. Production is forecasted for 44 million lbs annually. This entry was posted in coating/laminating, flexible packaging, package printing, paper/paperboard/cartons and tagged Caraustar, converting, flexible packaging, packaging, paperboard packaging, plastic film, Toray Plastics. Bookmark the permalink.